Once, the great sage Narada Muni traveled to the abode of Lord Siva and began to glorify him, saying, "You are very near and dear to the Supreme Lord Krsna. Not only that, you are Krsna's manifestation; you are non-different from Him. You can give liberation and also Krsna-prema, the rare jewel of transcendental love for Krsna." Hearing Narada glorify him in numerous ways, Lord Siva became angry and said, "Your glorification of me is false. I am not at all dear to Sri Krsna." Lord Siva is actually most dear to Sri Krsna, and therefore Krsna can give him services which He cannot give anyone else. When the demigods and demons were churning the Milk Ocean in order to obtain the nectar of immortality, the first substance produced was a powerful and dangerous poison, burning the entire world. The demigods appealed to Sri Krsna, and He advised them to request Lord Siva to drink the poison. Thus, they worshiped Lord Siva and prayed, "Please save us! Only you can protect us!" Lord Siva collected the poison and took it in his mouth, but he hesitated to swallow it, considering, "Lord Krsna is in my heart. The poison will affect Him." He therefore kept the poison in his throat, which was burned, and his neck turned the color blue. Now, out of genuine humility, Lord Siva told Narada: "I want to be His beloved devotee, but actually I am not. You know that I always wear ashes from the burial grounds, and a garland of skulls. All my associates are ghosts and witches, so I am not qualified to be Krsna's dear devotee. If I am so dear to Him, why would He have ordered me to engage with the mode of ignorance in the terrible function of destroying of the universe? If I am such a great recipient of His mercy, why would he have ordered me to become Sankaracarya and preach a philosophy that is adverse to Him?" Actually, although he expressed otherwise, it was because Siva is so dear to Krsna that Krsna was able to give him the difficult task of appearing as Sankaracarya. Many people had been worshiping the Supreme Lord only to fulfill their selfish purposes, thinking, "Simply by our worship of God, He will be pleased with us and satisfy all our worldly desires." They worshiped Him only so that He would rapidly arrange for all of their needs, not to please Him. Lord Krsna thought, "This is very dangerous." He called Lord Siva and instructed him, "Such false devotees will create great disturbances, so keep them far away from Me. Create a philosophy which teaches, 'brahma satyam jagan mithya – the Absolute is true, this world is false.' You should preach, 'All souls are Siva; all souls are Brahma; all are one. You are brahma, the impersonal Absolute. There is no need to worship any other God; you are the Supreme God.' "
Reluctant, Lord Siva asked Krsna, "Can you please tell someone else to do this? I am not qualified for this service." Krsna replied, "No, you will have to do this. In the entire world, I see no one else who is as capable." Feeling ashamed, Lord Siva now told Narada, "At last, I had to agree to follow His order. Appearing as Sankaracarya I preached everywhere, 'You are brahma, you are brahma, you are the impersonal brahma. The entire world is false.' I am so much regretting this. I know I have committed a great offence by causing so many people to be averse to Lord Krsna. Still, to carry out His order I spread this doctrine. It is clear by the fact that He sometimes gives me such orders that I am not His dearest one." 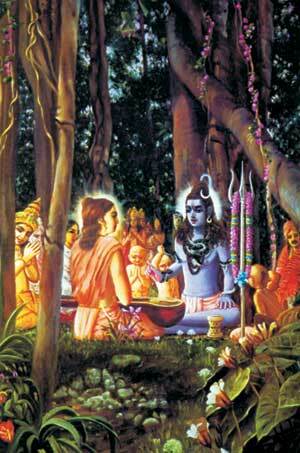 Lord Siva also expressed to Narada his regret in having given benedictions to Lord Krsna's enemies. To fulfill his Lord's desires, he had given benedictions to demons like Ravana, Vrkasura, Salva and Jayadratha, and thus he had performed many activities that were seemingly opposed to Krsna and krsna-bhakti. Narada Muni said, "Master, please don't try to mislead me. I know that whatever you do is to please Lord Krsna and to assist Him in His pastimes, for the benefit of all beings. You told me that you have many times given benedictions to His enemies. I know that His enemies, as well as the enemies of His devoted cousins, the Pandavas, worship you for ill-motivated benedictions. I also know that you grant them benedictions. But those benedictions are not foolproof; they always have some loophole. Actually, you cheat these beneficiaries in order to please Lord Krsna. You are undoubtedly His dearest friend." Siva and Narada continued to discuss some historical incidents which, according to Siva, proved that he was not dear to Krsna – but according to Narada, proved the opposite. The great epic Mahabharata tells of King Jayadratha, one of the many demons who received such a clever benediction from Lord Siva. Duryodhana, the paternal cousin of the five Pandava brothers, had given his sister Dushala in marriage to King Jayadratha, and therefore the king had also become like a brother-in-law of the Pandavas. Once, Jayadratha tried to kidnap the Pandavas' wife, Draupadi, desiring strongly to make her his own wife. As he forced her onto his chariot, she admonished him, crying, "I am the wife of the Pandavas. When they catch you, they will punish you and kill you!" Jayadratha's arrogance prevented him from hearing her, and he continued his abduction. Meanwhile, the sage Narada approached the Pandavas and informed them, "Oh, I saw Jayadratha taking away Draupadi, and she was weeping!" Two of the Pandavas, Bhima and Arjuna, immediately chased after Jayadratha. Bhima dismounted his chariot and ran faster than Jayadratha's horses. With his bow and arrows, Arjuna created a fire that surrounded the chariot of Jayadratha, who was then captured and could not move. Severely beaten by Bhima and arrested by Arjuna, Jayadratha was bound to the chariot and taken to where Yudhisthira Maharaja had been staying with Draupadi. Bhima and Arjuna spoke to Yudhisthira, their respected senior brother. Bhima urged him, "I want to kill Jayadratha. Please order me to kill him." In support of Bhima, Arjuna said, "Jayadratha has performed a heinous act and should be killed." King Yudhisthira replied, "The offense was committed against Draupadi. We should take the case to her, and we will do whatever she orders." When Jayadratha was brought at the feet of Draupadi, she mercifully told her husbands, "Don't kill him; forgive him. He is our brother-in-law. If you kill him, your cousin-sister will be widowed and she will weep for the rest of her life." Bhima and Arjuna then approached Lord Krsna and appealed to Him: "What should we do? We have vowed to kill Jayadratha, and now Draupadi tells us to forgive him." Krsna replied, "For one who has been honored, dishonor is worse than death." Arjuna then shaved King Jayadratha's head, leaving five patches of hair, and he shaved one side of his face, leaving the other side unshaven. Jayadratha felt humiliated, and after being released by Bhima and Arjuna he considered it better to have died. He thought, "I will somehow take revenge." Thus absorbed, he went to Gangotri in the Himalayas and undertook a severe type of penance to please Lord Siva. After some months he gave up all food, water, and bodily activities, and was about to die. At this point Lord Siva came before him and asked what boon he wanted as a result of his austerity. Jayadratha replied, "I want revenge against the Pandavas. I want to defeat and kill all of them." Lord Siva told him, "You can defeat the Pandavas, but only Yudhisthira, Bhima, Nakula and Sahadeva; not Arjuna." Jayadratha said, "If you cannot benedict me to my full satisfaction, then please grant that neither Arjuna nor anyone else will be able to kill me." Lord Siva replied, "I can grant you this: if your head is severed and falls on the ground, the person who caused this will die immediately. Your life will be saved and your head will rejoin your body. You may be 'killed' hundreds of thousands of times, but you will not die. On the other hand, if your severed head falls into your father's hands and he throws it on the ground, then you will die." Jayadratha was satisfied, thinking, "My father would never do this." When the battle of Kuruksetra began, Jayadratha took the side of the Pandavas' enemy, Duryodhana. One evening during the battle, as the sun was setting, Jayadratha's father was absorbed in prayer and making an offering of water to the Sun-god. Arjuna saw this opportune moment. With the skillful release of an arrow, he severed Jayadratha's head from his body and caused it to fall into the hands of his meditating father. Startled and without thought, Jayadratha's father tossed the head on the ground. Then, opening his eyes he exclaimed, "What was that wet thing?" Seeing that he had just thrown his son's head, he began to cry, "Oh my son! Oh my son! You are dead now!" Envious of Krsna and with a desire for the strength to destroy him, the demon Salva also took shelter of Lord Siva. He performed a severe type of austerity and ate no more than a handful of ashes daily. After one year, Lord Siva became pleased with him and asked him to beg for a boon. Salva begged from Lord Siva the gift of an airplane, saying, "This airplane should perform as I wish; it should be operated by my mind. On my order it should go to heaven or anywhere I desire. In summer it should be air-conditioned. If there are only two men, there should only be two seats, and if I want to travel with hundreds of thousands of persons, many seats should manifest. It should never crash due to mechanical difficulty, and it should be equipped with all varieties of weapons. It should be dangerous and fearful to the Yadus." Lord Siva agreed, and Salva was helped by the demon Maya Danava to manufacture a mystical airplane that began to destroy Dvaraka, Lord Krsna's abode. Salva personally attacked from above, and his soldiers attacked on the ground. Headed by Pradyumna, the Yadu dynasty warriors fought with Salva and his army, but they could not defeat him. Finally, Lord Krsna personally appeared on the battlefield, and after much intense fighting on both sides and many mystic displays by Salva, the Lord took up His disc, cut off the demon's head, and gave him liberation. The principle of Siva – Siva-tattva – is extremely complex. The principle of Brahma is not as complicated, because Lord Brahma is always a jiva, a finite spirit soul. Sometimes, when there is no qualified jiva, Lord Visnu (Krsna's expansion) personally takes the post of Brahma, but that is rare. Lord Siva is not like that; he is not a finite soul. After passing through the eight material coverings, and after crossing the Viraja (the river that divides the material world and the spiritual world) and the planet of Lord Brahma (the highest material planet), one comes to the planet of Siva. There he is known as Sadasiva, a manifestation of Lord Visnu. Siva-tattva can be understood by the analogy of yogurt and milk. Yogurt is nothing but a transformation of milk. Milk can become yogurt, but yogurt cannot become milk. This analogy is found in Sri Brahma-Samhita and elucidated in Srila Jiva Gosvami's commentary: "Just as milk is transformed into yogurt by contact with a transforming agent, Sri Govinda, Lord Sri Krsna, similarly accepts the form of Sambhu (Siva) in order to accomplish a specific purpose. The example of yogurt is actually given in order to convey the idea of cause and effect, not the idea of transformation. Sri Krsna is reality and cannot be transformed, so it is not possible for Him to undergo any kind of distortion. A wish-fulfilling gem manifests many things according to one's desire, yet its constitutional nature remains untransformed." When Sri Ramacandra was making the bridge to Lanka, he established a Siva-linga (deity form of Siva) called Ramesvara. All the common people began glorifying Lord Siva, shouting, "Ramesvara ki jaya! You are Rama's isvara: you are the lord of Rama." The demigods were unsatisfied by this and announced through an aerial voice, "Ramas ca asau isvarah: Rama is God, and Sankara is also God; they are the same." Hearing this, the Siva-linga broke. Lord Siva emerged from the linga and told them all, "You are all foolish; you do not know my tattva, the established truths regarding my identity. Rama is my beloved and my God, and that is why I am called Ramesvara." Lord Siva eternally resides in Lord Krsna's abode, Vrndavana, where he manifests many forms to render devotional services to Him. The form of Gopisvara Mahadeva was manifested by Lord Krsna's desire. When Krsna desired to perform His rasa dance, Srimati Radhika, the embodiment of His pleasure potency, manifested from His left side and Gopisvara Mahadeva manifested from His right side. The form of Siva who lives in Kasi or Kailasa in the material world is a partial manifestation of the original Sadasiva in Vrndavana. The many other commonly worshiped forms of Lord Siva are expansions of Sadasiva. They are not the original. Partial expansions such as Pippalesvara Mahadeva, Bhutesvara Mahadeva, Rangesvara Mahadeva and so on cannot award the benediction that can be attained by the mercy of Gopisvara – the highest perfection of love, namely vraja-prema. Srila Sanatana Gosvami, the great Vaisnava saint who resided in Vrndavana near the old Sri Madana-Mohana temple, would go daily to see Sri Gopisvara Mahadeva at his temple. Once, in his older years, Sanatana Gosvami had a dream wherein Gopisvara Mahadeva appeared and instructed him: "Now that you are old, please do not go through so much trouble to see me." Sanatana Gosvami replied, "I will continue to come. I cannot change this habit." Gopisvara Mahadeva said, "Then I will come and stay very near to your residence, manifesting in Bankhandi." The very next day, Sri Gopisvara Mahadeva appeared in Bankhandi, halfway between his original temple and Srila Sanatana Gosvami's residence. Seeing this, Sanatana Gosvami became overwhelmed with transcendental ecstasy, and from that day on he visited Bankhandi Mahadeva every day. Wherever he was, Srila Sanatana Gosvami could not live without his beloved Lord Siva – Gopisvara Mahadeva and Bankhandi Mahadeva in Vrndavana, and Kamesvara Mahadeva in Kamyavana forest. In Govardhana he would stay near his very dear friend, Cakresvara Mahadeva, who acquired the name when he served Govardhana Hill and the Vrajavasis by holding up his trident like a cakra, protecting them from the torrential deluge sent by King Indra. We honor Lord Siva as a great Vaisnava and as Guru. We do not worship him separately. We observe Siva-ratri, Lord Siva's appearance day, and we glorify him in connection to his relationship with Sri Krsna. Srila Sanatana Gosvami has written in his Hari-bhakti-vilasa that all Vaisnavas should observe Siva-caturdasi (Siva-ratri). Lord Siva, in whom all good qualities reside, should certainly be honored by the observance of this day. O Gatekeeper of Vrndavana! O Soma, all glories to you! O you whose forehead is decorated with the moon, and who is worshipable by the sages headed by Sanaka, Sanandana, Sanatana and Narada! O Gopisvara! Desiring that you bestow upon me prema for the lotus feet of Sri Sri Radha-Madhava, who perform joyous pastimes in Vrajadhama, I offer obeisances unto you time and again. A brahmana in Kasi Varanasi once prayed to Lord Siva, "I want to give my daughter in marriage, but I have no money. Please give me money." Lord Siva told him, "Go to Vrndavana and meet with Srila Sanatana Gosvami. You can ask him to give you some wealth for your daughter's marriage." The brahmana went to Vrndavana, by foot, and there he asked the villagers there for the whereabouts of a person named Sanatana Gosvami. As they all knew him, they pointed out his residence. Srila Sanatana Gosvami was practicing bhajana near the Yamuna River at Kaliya-hrada, the former abode of the very poisonous snake named Kaliya. Kaliya-hrada was close to the Yamuna, and therefore its surrounding area was full of sand. Srila Sanatana Gosvami wore only a loincloth. He used to go begging door-to-door for a small amount of prasada (Krsna's food remnants), and would take as his meal only one dry chapatti (flat bread), with no salt. The brahmana arrived at his cottage and told him, "I went to Sankara Mahadeva, Lord Siva, and he told me to meet you. He said you will give me some wealth for my daughter's marriage." Sanatana Gosvami replied, "I have no possessions. You can see that I have nothing but a loincloth." Then he thought, "Oh, Siva cannot tell a lie. He is my bosom friend." Thinking of Lord Siva and contemplating further, he remembered a touchstone he had once disgarded and then forgotten. Now he told the brahmana, "Go to the Yamuna and remove some of the sand, and there you will find a touchstone. It is somewhere in the sand, though I don't remember where." The brahmana found the jewel, touched it to iron, and the iron turned into gold. He was very, very happy that Lord Siva had told him to come to Vrndavana, and thought with gratitude, "My prayer has been answered by him." On the way home, however, his greed for money increased and he began thinking, "Why did Sanatana Gosvami keep the touchstone in the sand? It had no use there. He must have still more valuable jewels." He thus returned, and Sanatana Gosvami asked him, "Why have you come back?" He replied, "I've come because I know that you have more valuable jewels than this." Sanatana Gosvami then said, "Go and throw the touchstone in the Yamuna. The brahmana did so with all his power, and then Sanatana Gosvami told him, "Come here. Come here." He gave him the mantra, "Hare Krsna Hare Krsna Krsna Krsna Hare Hare, Hare Rama Hare Rama Rama Rama Hare Hare" and said, "I do not have worldly jewels, but I have transcendental jewels. The jewel of Lord Krsna and Sri Radha will come to you in a very short time. So remain here. Your daughter's marriage will take place automatically. Stay here and chant Hare Krsna." That brahmana followed his instruction and became a very elevated saint.